The two decades in American history from 1940 to 1961 were the years America stepped upon the world stage as the greatest super power in world history. Fortunately for the United States, one of the most prominent and powerful leaders in American history during those momentous and pivotal years was General Dwight David Eisenhower. 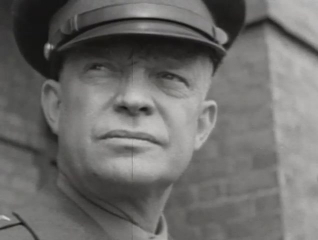 This 20 part series, The Eisenhower Era, presents the life and times of General Dwight David Eisenhower, from the fateful days just before the start of WWII to the end of his Presidency in 1961. In 1939, Dwight Eisenhower was a colonel in the Philippines, the U.S. Army numbered barely 100,000 men, and the country believed itself safe behind the shield of isolationism. Program 1 examines how General Dwight Eisenhower and the United States overcame two decades of isolationism and successfully met the extraordinary challenges of WWII, a war that threatened to the destroy the very basis of American, and indeed, world civilization. Produced with interviews and footage of General Andrew Goodpaster, Gunter Diehl, Colonel Merrill Pasco, Frank Gillard and Pamela Harriman. 00:03:16Colonel Dwight David Eisenhower was stationed in the Philippines while America maintained its policy of Isolationism as Adolph Hitler remilitarized Germany. 00:06:40As Adolph Hitler sent Germany's armies to conquer Europe, only Britain led by Prime minister Winston Churchill stood against Germany, while General George Marshall and President Roosevelt mobilized the American military. 00:03:24On December 7th 1944 Japan's Imperial fleet attacked Pearl Harbor in an attempt to destroy America's Pacific Fleet which led to American declaring war on Japan and General George Marshall and General Eisenhower drawing up American war plans. Program 2 lays out the discussions and implementation of the initial Allied strategy in the war against Nazi Germany, a strategy that pitted British interests in fighting Germany in North Africa against American interests of launching a cross channel invasion. Produced with interviews and footage of General Andrew Goodpaster, Ralph Martinl, Colonel Merrill Pasco, Frank Gillard, Pamela Harriman and Colonel Chet Hansen. 00:03:39General George Marshall sent General Eisenhower to head U.S. forces in Europe while British General Montgomery was defeating German Field Marshal Rommel in North Africa at the Battle of El Alamein. 00:04:40American Generals Eisenhower and George Marshall devised overall strategy while Generals George Patton and Omar Bradley led American forces in North Africa against the Germans. 00:03:55While General Eisenhower was coordinating American strategy in North Africa, the tide in the war against Germany was turning in Sicily and on the Russian front, and the Japanese were being pushed back in the Pacific Theater. 4.) Chapter 4: Allies Agree on "Overlord"
00:02:11General George Marshall picked General Eisenhower to be the Allied Supreme Commander for Operation Overlord. Program 3 depicts General Dwight Eisenhower's preparations and execution of WWII's historic 'Operation Overlord', the cross channel invasion of Nazi held Europe on the beaches of Normandy on D-Day, the 6th of June, 1944. Produced with interviews and footage of Frank Gillard, Pamela Harriman, Colonel Carter Burgess, Colonel Barney Oldfield, Colonel Chet Hansen, William Colby, Major John Henderson and Lieutenant Commander Mladin Zarubica. 1.) Chapter 1: Preparing "Overlord"
00:05:24General Eisenhower was the Allied Supreme Commander for Operation Overlord, the attack against Hitler's Fortress Europe. 00:05:42As the Allied Supreme Commander, General Eisenhower was in charge of Operation Overlord and D-Day, while General George Patton was picked to head a fictional Army in order to confuse the German Army command. 3.) Chapter 3: "OK, Let's Go"
00:04:13Operation Overlord began on D-Day, June 6, 1944. 00:03:50The strategy for Operation Overlord, which began on D-Day, June 6th, called for assaults on the beaches of Normandy, where British General Montgomery was to take Caen and push inland, however the inland push was delayed and did not get started until July 26th when General Patton's Army led American forces across France, freeing Paris. Program 4 shows the final days of the war, as the Allied Supreme Commander, General Eisenhower dealt with the American and British generals fighting with each other over the strategy to end the war, the final push into Germany by the Allies, and post war planning for Germany. Produced with interviews and footage of Frank Gillard, Colonel Merrill Pasco, Hans Tuch, General Andrew Goodpaster and Colonel Chet Hansen. 00:05:48General Eisenhower supported General Montgomery's plan, Operation Market Garden in a push out of Normandy to cross the Rhine River at Arnhem. 00:05:15Against the German offensive known as the Battle of the Bulge that blasted through the Ardennes Forest, General Eisenhower saw a chance to destroy the German Army with a pincer movement led by Generals Montgomery and Bradley in the North and General Patton in the south. 00:02:07While General Eisenhower led forces in the field through his commanders, General Montgomery and General Bradley, Stalin, Churchill and Roosevelt met at Yalta to plan the Post war world. 00:05:26After crossing the Rhine River over the bridge at Remagen and going deep into Germany, General Eisenhower halted American forces at the Elbe River, leaving Berlin to the Soviets, and after the war Allied leaders met at Potsdam to settle post war plans and talk about defeating Japan. Following WWII, the warm feelings between the U.S. and its ally the USSR disappeared rapidly. Program 5 examines the great events of the post WWII period and Eisenhower's influence on them as a war leader in Europe and then as Chief of Staff of the Army. Produced with interviews and footage of Frank K. Kelly, Colonel Barney Oldfield, John Eisenhower, General Andrew Goodpaster, Lieutenant Commander Mladin Zarubica, Colonel Chet Hansen, William Colby and Winston Churchill. 00:03:30At war's end the decision by General Eisenhower, the Allied Supreme Commander, to halt American forces at the Elbe River and not go on to Berlin was greatly debated. 00:03:22Because of many post-war problems, including refugees, homelessness, starvation, the war trials at Nuremberg and the division of Germany into zones, General Eisenhower had no time to second guess his decision to halt American forces at the Elbe River. 00:05:11General Eisenhower and Soviet war leader, Marshal Zhukov, carried on good relations while at Potsdam the Big Three - Stalin, Clement Atlee and Harry Truman - discussed the war with Japan, which America would end by dropping two A-bombs, developed in the Manhattan Project on Hiroshima and Nagasaki. 00:06:57General Eisenhower, who became the Army Chief of Staff, Winston Churchill, who warned of an Iron Curtain across Europe, and President Harry Truman, who issued the Truman Doctrine, warned America against continuing isolationism and the idea that only U.S. aid, leadership and guidance could save the world from stand communism. At a time when the democracies of Western Europe were in danger of falling apart, America needed to end its isolationism. In program 6 as America stepped onto the world stage as a super power, entering the Cold War against the USSR, Eisenhower retired from a life of service to his country. Produced with interviews and footage of Colonel Chet Hansen, John Eisenhower, General Andrew Goodpaster, Walter Cronkite, Najeeb Halaby, General George Marshall, Frank K. Kelly, President Harry Truman, Sir Nicholas Anderson, Lord Carver and Herbert Brownell. 00:06:24With the Soviet Union trying to take over Iran, Greece and Turkey, Secretary of State George Marshall suggested the Marshall Plan to help Europe and other countries recover from WWII, while President Truman implemented a policy for the containment of communism beginning with the National Security Act. 00:04:54In 1948 General Eisenhower retired and became president of Columbia University, while at the same time the House Un American Activities Committee, HUAC, began investigating communism in the U.S. and Harry Truman faced a tough nominating process in his own party and the Berlin crisis. 3.) Chapter 3: How to Defend Western Europe? 00:03:46With Eisenhower as a military advisor, President Truman faced the crisis of the Berlin Airlift when the Soviet Union shut down all other traffic into Berlin, while at the same time America's allies, Britain and France faced crises in Palestine and Indo-China. 00:04:13While Dwight Eisenhower, served as an unofficial military liaison with the armed forces, NATO was founded by the U.S. and its allies as a counter to the Soviets who had just tested their first A-bomb and thus launching the nuclear arms race. Program 7 shows how with the explosion of a Soviet A-bomb, the communist threat to western democracies, and new fronts in the Cold War opening in Asia, the world rapidly approached the brink of nuclear war. Produced with interviews and footage of George Herman and Colonel Chet Hansen. 00:03:06Communism was spreading through Asia quickly in China and North Korea, and the only bulwarks against it were Formosa under Chiang Kai Shek and South Korea. 00:04:28North Korea started the Korean war by invading South Korea, however President Truman and his Secretary of State, Dean Acheson, ordered troops to stop the invasion, which General MacArthur accomplished with a surprise amphibious landing behind enemy lines at Inchon near Seoul, which enabled American and U.N. forces to push all the way to the border with China at the Yalu River. 00:04:14With the world on the brink of nuclear war because of the fighting in Korea, President Truman did two things to strengthen democracy throughout the world without having to resort to nuclear weapons: relieve Genera MacArthur of command in Korea and send American troops to bolster NATO. By the 1950s the world was preparing to defend itself against a possible Soviet invasion of Europe and fighting the communists in South Korea. Program 8 looks at how General Eisenhower's appointment to lead NATO strengthened western democracies' determination to stand firm against communism. Produced with interviews and footage of Sir David Hunt, John Eisenhower, General Andrew Goodpaster, William Colby, Lord Carver, Dr, Horace Osterheld, Erich Menda, President Richard Nixon and John G. Adams. 00:03:38With the Soviet Union takeover of Czechoslovakia, Truman needed to bolster American involvement in Europe, so he sent General Eisenhower to head NATO. 00:04:41Eisenhower went to Europe to make NATO into a competent force to stop the Soviet Union's Red Army from taking over Western Europe, which was still suffering in spite of help from America's Marshall Plan. 00:08:05In order to beef up the Atlantic alliance under NATO against the Soviet Union, which had the atomic bomb, General Eisenhower decided it was necessary for the rearmament of Germany under the leadership of Chancellor Adenauer. 00:02:13At home America was stronger than ever against menace of the Soviet Union and Red China, however, unscrupulous politicians like Senator Joseph McCarthy used the threat of communism as way to instill fear in the American people and go on witch hunts for supposed communists within America's government. In program 9 Eisenhower campaigns for and wins election to the presidency amid the backdrop of Cold War politics, including war in Korea, communism in China and the Soviet menace in Eastern Europe. Produced with interviews and footage of Walter Cronkite, Abbot Washburn, John Eisenhower, George Reedy, President harry Truman, Adlai Stevenson, Herbert Brownell, President Richard Nixon, Herb Klein, George Herman, Abbot Washburn, Robert Donovan, Ray Scherer and Barbara Gunderson. 00:04:13In the 1952 presidential election there were two possible candidates for the Republican party - Robert Taft and General Dwight Eisenhower who still led NATO; and for the Democratic party Adlai Stevenson after Truman refused to run again. 00:03:35Dwight Eisenhower won the nomination and chose anti-communist Richard Nixon, who gained fame prosecuting Alger hiss, to be his vice president, and while some conservative republicans mistrusted Eisenhower, Governor Tom Dewey of New York supported him. 00:03:59Accused of misconduct, Richard Nixon cleared his name with his famous Checkers Speech, which cleared the way for him to continue as Eisenhower's running mate, though Ike faced other problems with the rabid anti-communists Senators Joseph McCarthy and William Jenner. McCarthyism in the early 1950s created a period of intense fear and paranoia sweeping the land and threatening the nation's basic values. Program 10 examines the role of Dwight Eisenhower during this period as he ran for office and was elected President. Produced with interviews and footage of Hugh Sidey, George Reedy, Barbara Gunderson, Jim Wright, General Andrew Goodpaster, Rocco Siciliano, Robert Donovan, Elliot Richardson, Bob Clark, William Ewald, Herbert Brownell, President gerald Ford, Douglas Dillon, John G. Adams and Robert Donovan. 00:05:56When first elected, President Eisenhower faced serious problems with demagogue, Senator Joseph McCarthy, whose anti-red hysteria, fueled by the communist spy ring of Julius Rosenberg and Ethel Rosenberg, tore apart America. 00:07:11When running for President, and later as a new President, Eisenhower had to figure out how to deal with Senator Joseph McCarthy's anti-communism witch hunt against American patriots such as George Marshall. 00:05:15President Eisenhower had to deal with Senator Joseph McCarthy's anti-communism witch hunt in the U.S. government. By 1953 the hysteria of McCarthyism reached its peak when the Wisconsin Senator attacked the U.S. Army for harboring communists. Program 11 shows how President Eisenhower handled Joseph McCarthy and his politics of fear and how by attacking the Army, McCarthy ended his reign of terror. Produced with interviews and footage of Robert Donovan, Barbara Gunderson, Robert Kieve, Ray Scherer, William Ewald, Herbert Brownell, John G. Adams and John Steele. 00:05:03President Eisenhower launched an indirect campaign to stop Senator McCarthy and his McCarthyism. 00:04:17President Eisenhower and his administration finally had a means to stop McCarthyism when McCarthy attacked the Army and individuals at Fort Monmouth who knew the Rosenbergs. 00:04:31McCarthyism ended when the Senate voted to censure Joseph McCarthy. Program 12 looks at the long festering domestic issue of racial segregation in America and how President Eisenhower dealt with desegregation, both personally and as President. Produced with interviews and footage of Judge John Minor Wisdom, Herbert Brownell, Frederic Morrow, William Ewald, William P. Rogers, Maxwell Rabb, John Steele and President George Bush. 00:06:27In 1953, segregation was the law of the land, dating back to the 1896 U.S. Supreme Court Case, Plessey v. Ferguson, but President Eisenhower supported civil rights personally and in his first days in office he undertook to desegregate Washington, DC through persuasion. 00:04:32President Eisenhower never commented on the U.S. Supreme Court's decision on Brown v Board of Education led by Chief Justice Earl Warren that outlawed segregation in schools and paved the way to integration and civil rights. 3.) Chapter 3: With All "Deliberate Speed"
00:03:23To counter the Southern Manifesto that stated desegregation was unconstitutional, President Eisenhower appointed federal judges who would help carry out the U.S. Supreme Court's order to move civil rights forward through desegregation with deliberate speed. Program 13 depicts how the U.S. Supreme Court's ruling in Brown vs. Board of Education set the stage for a major showdown between the federal government and the states, a showdown in which President Eisenhower used the power of the federal government to enforce integration in the south. Produced with interviews and footage of Herbert Brownell, President Gerald Ford, Jim Wright, Senator Richard Russell, John Connally, William Ewald, Hugh Sidey, Orville Faubus and Frederic Morrow. 00:05:19With the murder of black teenager Emmett Hill in Mississippi, the civil rights issue came to the fore in the public and in the Congress, where President Eisenhower supported civil rights legislation and a very powerful civil rights bill. 00:03:36President Eisenhower supported the civil rights bill and Senator Lyndon Baines Johnson pushed it through the Senate. 00:03:37To enforce desegregation in Little Rock, Arkansas's Central High School, President Eisenhower sent troops from the 101st Airborne to maintain order over the objections of Governor Faubus. In the 1950s the Senate led by Lyndon Johnson and the House led by Sam Rayburn vied with the Presidency over control of the federal budget. Program 14 shows how President Eisenhower used his quiet style of working with the Congress to balance the budget while at the same time supporting necessary programs in the military, science and technology in the fight to win the Cold War. Produced with interviews and footage of Hugh Sidey, John Connally, Charles Corddry, Dr. Herbert York, General Andrew Goodpaster, Gerald Ford, President Ford, Arthur Larson, Jim Wright, President Richard Nixon, Maurice Stans, Eileen Shanahan, General Bernard Schriever and Dr. Joseph Charyk. 00:05:02President Eisenhower, Senate Majority leader Lyndon Johnson and House Speaker Sam Rayburn agreed on issues of national security in the nuclear arms race with the Soviet Union. 00:05:54President Eisenhower was for balancing the federal budget even though fighting the cold war with the Soviet Union meant spending money on technological developments, but at the same time, he supported certain government public works such as the interstate highway system and the St. Lawrence Seaway. 00:03:14President Eisenhower supported America's ICBM program to keep ahead of the Soviet Union in the nuclear arms race between the two nuclear super powers. In the early 1950s, the Soviet Union repeatedly challenged the U.S. in the race to create bigger and more destructive nuclear weapons, as well as in the race to control space. Program 15 looks at how President Eisenhower dealt with these Cold War clashes and their effects on the federal budget. Produced with interviews and footage of General Bernard Schriever, Georgi Grechko, Lydon Johnson, President Johnson, Alexei Adzhubei, Maurice Stans, Douglas Dillon, John Eisenhower, James Reston, Mansfield Sprague, Father Avery Dulles, General Andrew Goodpaster, Abbott Washburn, Dr. Ray Cline, Georgi Kornienko and President Richard Nixon. 00:03:31With the launch of Sputnik by the Soviet Union, America was put on the defensive militarily and President Eisenhower had to assure the American people we were strong in both the space race and the nuclear arms race with our ICBMs. 00:04:44After Sputnik and a meeting with Khrushchev, President Eisenhower had to balance the U.S. budget in spite of the arms race with the Soviet union. 00:03:20By telling the American people that there was a missile gap between the U.S. and the Soviet Union, John F. Kennedy was able to defeat President Eisenhower's vice president, Richard Nixon in the 1960 presidential election. By 1953 the Korean war was at a stalemate against the Chinese and the Soviets continued to build up their nuclear arsenal. Program 16 examines President Eisenhower's first days in office and how he dealt with these threats to American security. Produced with interviews and footage of John Eisenhower, James Reston, Mansfield Sprague, General Andrew Goodpaster, Father Avery Dulles, Abbott Washburn, Dr. Ray Cline, Georgie Kornienko and President Richard Nixon. 00:05:03As Eisenhower prepared to become President, he faced a world in turmoil with the Soviet Union in control of Eastern Europe and poised to attack Western Europe, nationalist uprisings in the Middle East that tried to shake off their colonial masters, such as Britain, and the fact that the war in Korea could not be won by attacking the Chinese backed and led North Korean Army. 00:06:13President Eisenhower relied heavily on Cabinet members Secretary of State John Foster Dulles and Secretary of the Treasury George Humphrey as well as the CIA to help guide the country using the Solarium Project, which had three prongs - containment, roll back and retaliation - in the nation's cold war fight against the Soviet Union. 3.) Chapter 3: Ike's "New Look"
00:06:10In upgrading the U.S. military, President Eisenhower downgraded the importance of the Army by emphasizing technology such as B-52s, nuclear subs, and Intercontinental Ballistic Missiles, while John Foster Dulles ended the Korean War by hinting to the Chinese through Indian intermediaries that Eisenhower was considering using atomic bombs to stop the fighting. Under the backdrop of the Soviet Union's continuing parity with American nuclear technology and communist inroads into western Europe and Asia, program 17 looks at President Eisenhower's policies in Europe and the Far East. Produced with interviews and footage of William Colby, John Foster Dulles, Kermit Roosevelt, Douglas Dillon, Pierre Pflimin, Melvin Laird, James Reston, John Eisenhower, Dr. Horst Osterheld, Mansfield Sprague and Robert Bowie. 00:04:59President Eisenhower and the U.S. faced an imperiled world in 1953 - communism had taken over Eastern Europe and the Soviet Union was trying to get Italy out of NATO and into the Warsaw Pact to weaken western Europe, while the U.S. faced problems in Iran and France had troubles in Vietnam. 00:05:28President Eisenhower called a meeting with John Foster Dulles, Richard Nixon and Admiral Radford to discuss aid to France in Indo-China to fight communism under the Mutual Defense Assistance Program, but Ike said no and France lost at Dien Bien Phu. 00:04:13President Eisenhower wanted to have West Germany under Konrad Adenauer as part of the European Defense Community during the Cold War, but France voted against it. 4.) Chapter 4: How Many Bombs Are Enough? 00:04:58After the Soviets brutally repressed a revolt in East Berlin, President Eisenhower, learning of the super destructive powers of the new H-Bomb, asked for a peace initiative on atomic energy to include the Soviet Union and every nation. By 1955 the threat of war in Europe had escalated, West Germany had been rearmed, and America faced a powerful foe in Asia - China. Program 18 discusses President Eisenhower's foreign policy during a decade when the America faced crises on two fronts and the world was under the threat of war and nuclear annihilation. Produced with interviews and footage of Robert Bowie, Father Avery Dulles, John Hanes, William Ewald, President Richard Nixon, Ray Cline, General Vernon Walters, John Eisenhower, Douglas Dillon, William Colby, Edward Heath and Christian Pineau. 1.) Chapter 1: War with "Red" China? 00:05:34President Eisenhower and his Secretary of State John Foster Dulles faced a major diplomatic crisis when Mao Tse Tung had Red China shell the small islands of Quemoy and Matsu that had been staging grounds for raids by Chiang Kai-shek who ruled Formosa. 00:06:00President Eisenhower and John Foster Dulles set up the Big Four Summit in Geneva for the U.S., Soviet Union, France and Great Britain to promote the, Open Sky program that would allow planes like the U-2 to do reconnaissance, but Khrushchev vetoed the idea. 00:04:13As President Eisenhower made a bid for re-election, he faced two new crises, one in the Middle East, where Egypt's Gamal Nasser nationalized the Suez Canal, owned and operated by Britain and France, and a revolt in Hungary which was brutally suppressed by the Soviet Union who kept Hungary behind the Iron Curtain. 00:04:36President Eisenhower called Britain's Anthony Eden and ended Britain and France's joint military venture to take back the Suez Canal. In 1957 the USSR surprised the world by launching Sputnik, the first manmade satellite to circle the globe, while America faced off against a new Soviet leader, the mercurial Nikita Khrushchev. Program 19 examines President Eisenhower's response to the Soviets in the race to conquer space and in the race for ICBM supremacy. Produced with interviews and footage of General Andrew Goodpaster, Joseph Charyk, Ray Cline, Mansfield Sprague, Karl-Gunther Von Hase, General Vernon Walters, Heinz Weber and Dr. Erich Mende. 00:05:59When the Soviet Union launched Sputnik in 1957, President Eisenhower was unable to reassure the American people that they were safe because of our ICBMs, U-2 flights, Vanguard missile project and nuclear submarines, until the U.S. launched its own satellite, Explorer 1 in 1958. 00:03:55During the Cold War, President Eisenhower went head-to-head with Khrushchev over crises in the Middle East and Berlin. 00:06:33in 1957 President Eisenhower, John Foster Dulles and the leadership of NATO faced a crisis with West Germany's Konrad Adenauer over a Soviet Union ultimatum on Berlin. At the end of the 1950s, America and the USSR squared off against each other, each armed with enough ICBMs, long range bombers and nuclear submarines to destroy the world. Program 20, discusses the events surrounding the Cold War diplomatic breakthrough at Camp David, spearheaded by President Eisenhower. Produced with interviews and footage of Sergei Khrushchev, David Eisenhower, General Andrew Goodpaster, Nikita Khrushchev, Alexei Adzhubei, Dr. Herbert York, James Reston, John Eisenhower and Robert Bowie. 00:06:08After Soviet Premier Nikita Khrushchev visited the U.S., President Eisenhower at Camp David agreed to visit the Soviet Union. 2.) Chapter 2: The U-2 Kills "Spirit of Camp David"
00:06:54When the Soviet Union brought down Gary Francis Power's U-2 plane during its 1960 fly over of the Soviet Union, it killed the spirit of Camp David accord reached by President Eisenhower and Khrushchev the year earlier. 00:03:42President Eisenhower's legacy was somewhat tarnished by the collapse of Soviet American relations in the Cold War following the downing of the U-2 spy planer over the Soviet Union, however his stature still remains large in that he set the rules governing the Cold War interactions and in his farewell address he warned the country against the military industrial complex.